At its foundation in 1996 the aim of the German Limes Road association was to create a touristic route for motorists. Meanwhile 93 towns and boroughs are members of the association chaired by the Lord Mayor of Aalen as well as numerous districts and tourism alliances. It manages not only the German Limes Road but also the later on created German Limes Cycle Path. By this means the Association managed to establish two important routes that allow to realize a touristic exploitation and impart knowledge about the Upper Germanic-Rhaetian Limes, which was declared part of the UNESCO World Heritage in 2005. 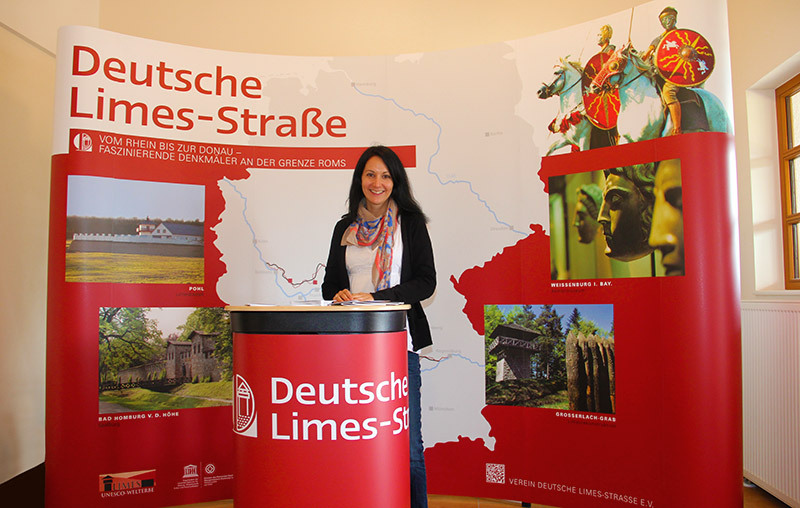 By providing information and via its marketing activities the Association wishes to draw attention to its routes and to the unique archaeological site in Germany and abroad. The Limes Road, which became the most successful touristic route in Germany, runs around 700 km from Bad Hönningen on the banks of the river Rhine through Rhineland-Palatinate, Hesse, Baden-Wurttemberg and Bavaria to Regensburg on the Danube. On this road as well as on the 800kms-long Cycle Path the traveller crosses a diversity of different natural landscapes and will meet besides the roman monuments many sights dating back to different ages. Special signposts and information signs will lead him to particular monuments and information points. Furthermore the association provides support for its members and the museums along the Limes in event management and public relations. Meanwhile it has taken the responsibility for the long-standing Limes Hiking Trail, which was maintained by hiking associations before. By advertising and supporting the maintenance of this path, the association now promotes also the discovery tour along the Limes on foot.